Here at DeansCards.com, we are always looking for Venezuelan Topps. Some of the Venezuelan Topps can be easily identified by the Spanish and English printed on the backs. These cards were first released in 1959, around the time that the government in Venezuela would become more stable and democratic. They were sold as parallel sets to the regular 1959 Topps issue. 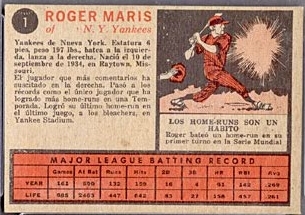 However, the 1959 Venezuelan set would stop after card #196. The 1959 cards can be identified by the Spanish phrase “Impreso en Venezuela por Benco Co.” on the back of each card. The Benco Company was the Venezuelan printer that Topps decided to use. Topps would release another Venezuelan set in 1960 that also included only 196 total cards and could be distinguished by their faded appearance. The next set would be released two years later in 1962 and would include two extra cards (#199 and #200) that featured Elio Chacon and Luis Aparicio, two natives of Venezuela. Numbers 197 and 198 are skipped in this set. The next release of Venezuelan cards would be in 1964. 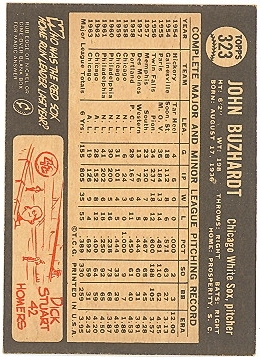 The 1964 set was much larger at 370 cards and could be distinguished from the regular Topps issue by the large black margin on the backs of the cards. 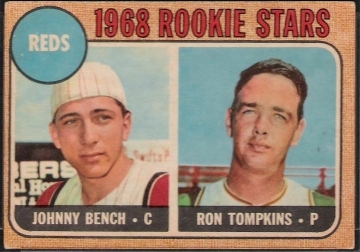 The next printing of Venezuelan Topps would be in 1966 with another 370-card set. The backs of the 1966 Venezuelan Topps are much darker than their American counterparts. A 1967 Venezuelan set was released, but it features both Venezuelan league players in addition to the MLB players. The final printing of a Venezuelan Topps issue would be in 1968 with another 370-card set. These cards look the most different from the regular issue because they were printed on gray card stock and have a orange, instead of yellow, back. Some, but not all, of the Venezuelan cards have the phrase “Hecho en Venezuela -C.A. Litoven” on the backs. For many of the Venezuelan years, the card stock is lower quality and, therefore, it is much more difficult to find these cards in high grades. Not only is the overall population small, but many cards cannot be found that grade over a Very Good/Excellent or Excellent. Topps’ foreign market has provided some of the most interesting cards of the 20th century. DeansCards.com is always looking to buy collections that include Venezuelan Topps cards. If you are interested in more information about selling your collection, please click here. To see our selection of Venezuelan cards, please click here.